In August 2018, President Abdel Fattah Al-Sisi ratified the Internet Technology Crimes and the Supreme Media Council laws, two laws that clearly establish the practice of blocking websites and monitoring communications in Egypt. Prior to the adoption of these controversial laws, the Egyptian legal environment lacked the legal cover and justification for the large-scale block policy by Egyptian authorities since May 2017, resulting in the blocking of nearly 500 sites, according to the latest AFTE report. The absence of legislative regulation of government practices, any government, especially when it is so extensive in its encroach on the rights of citizens, entails judicial intervention to read, refute and put a limit to such practices. A number of cases have been filed before the Administrative Court concerning the block of certain sites. Among these cases are the ones by Mada Masr to demand the disclosure of the reasons and grounds for blocking their website inside Egypt. However, all cases are still pending before the administrative courts. We have not yet been able to clarify the position of the administrative judiciary on the government’s campaign against websites. 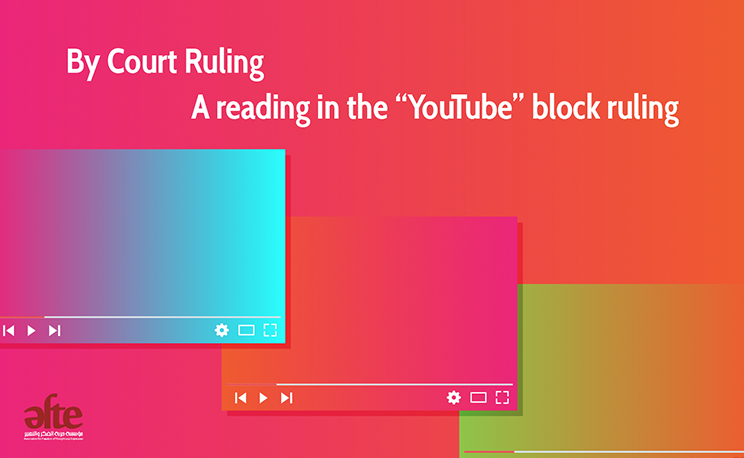 However, another case concerning the blocking of the YouTube site has been completed, and a final judgment has been issued by the Supreme Administrative Court that has enabled us to understand a little about the administrative judiciary decision in this regard. The relatively long period of litigation (the case was held in 2012) enabled us to observe the changing attitude of the Egyptian judiciary and its view of these practices. This change coincided with the development of the position of the executive authority. A lawsuit against the block of YouTube was filed on September 18, 2012, in which the plaintiff challenged the negative decision by the NTRA to refrain from taking the necessary legal measures to block the YouTube site and the links to a video that was deemed offensive to the prophet. In the first session of the lawsuit, the plaintiff presented a CD containing various sections of the video, explaining that these clips are being circulated under different titles such as MUHAMMAD MOVIE TRAILER, innocence of Muslims, the film insulting the prophet. Accordingly, the Administrative Court of Justice ruled that YouTube was banned for a month. Despite the recommendation of the Supreme Administrative Court’s board of governors to revoke the first instance ruling, the first chamber of the Supreme Administrative Court (called the Department of Rights and Freedoms) approved the final ruling. During the course of its consideration, the lawsuit went through several litigation stages, through which the judicial authorities expressed their opinion on the subject of the case. They unanimously agreed that the abusive links should be blocked and disagreed with regard to blocking the entire site. In addition, this phase witnessed major changes in the attitudes of courts as regards the expansion of internet monitoring, although there are clear breaks and leaps that can be identified by reading the evidence that judicial authorities relied on to block the site. The issue here is not only about the legal grounds in the narrow sense – i.e. a quote of the text or the legal ground – which was adopted in the block decision to withhold, but is rather about how to read and apply the text and sometimes strengthening it under the provisions of international covenants and conventions. This paper attempts to review what is stated in the case papers in various degrees of litigation, starting from the Administrative Court to the appeal submitted to stop the execution of the judgment, the report of the Commission of Commissioners and the ruling of the Supreme Administrative Court. The paper also gives some attention to some of the judgments issued in a number of cases related to the blocking of sites or cut of telecommunications services, which were considered by administrative courts. Chapter I addresses the different stages of the proceedings, while the second chapter presents the reasons for the judgment. The 3rd chapter pays more attention to clarifying the principles established by the provision. A lawsuit was filed against YouTube on September 18, 2012, which, as we have pointed out, was an appeal against the negative decision by the administrative authority (in this case in the NTRA) to refrain from taking legal action to block the site because of the screening of a film offensive to the Prophet . In the first stage, the plaintiff submitted a CD containing sections uploaded on the website, which he considers to be offensive to the Prophet, explaining that these sections are circulated under different headings such as MUHAMMAD MOVIE TRAILER, Innocence of Muslims, the film insulting the prophet.. Through the questions posed by the presiding judge during the hearing, the NTRA defense felt that the court deplored the failure of NTRA to take action on this incident. The court adjourned the case to January 12, 2013. Prior to this hearing, the NTRA addressed a number of service providers to take necessary action. During this period, it also established a website entitled: Protecting Egypt, through which similar links could be reported. During the hearing, NTRA’s defense submitted a case file on seven books dated 9 January 2013 from the National Telecommunications Regulatory Authority (NTRA) to the Internet service providers in Egypt, as stated in the portfolio, which included a warning to implement the NTRA’s decision to compel companies to block the link of the offensive film to the Holy Prophet on Google and YouTube and prevent access to it from within the Arab Republic of Egypt, provided that these companies clarify actions taken by them in this regard and complete the process of blocking and notify NTRA of any difficulties they encountered in implementing this decision. However, the discussions at this session gave the clear impression that the court was not satisfied with the actions taken by the NTRA in relation to the case in question. This is evidenced by the discussion between the court and the defendant, who blocked the entire YouTube site until the it removed all the offensive contents of the said film and any videos or films against Islam and the Prophet were removed, because it is impossible to partially block sections on YouTube since the site and its followers are copying the offensive film to the Prophet under various titles on the site and thus it is impossible to delete and prevent these sections offensive to the Prophet, without complete blocking of YouTube. It was clear during the discussion between the presiding judge and the plaintiff that the court had established its faith in the case. It asked him to amend his requests to block the YouTube site completely for one month. On this basis, the court reserved the case for judgment on February 9, the date it actually passed its ruling. The first chamber of the Supreme Administrative Court considered the appeals that were made against the ruling of the Administrative Court to block YouTube and referred the case to the Committee of Commissioners for the preparation of a legal opinion. The report responded to questions posed by the appeal papers presented in the case, and the report succeeded in one way or another to move the debate on the legality of the blocking procedure to a clearer area, highlighting the absence of a binding legal basis for the Egyptian authorities to take blocking action. The report pointed out at first that there were both the formal and objective elements to be provided in the challenged decision. It indicated that the legal basis that could be relied upon to take a blocking decision had been determined by the provisions of many international treaties that all appropriate and effective measures should be taken to combat intolerance, and eliminate all discrimination based on religion and belief, and that no one may be subjected to coercion that would impair freedom to profess a religion or belief. The report pointed out that the violations attributed to the site of “YouTube”, in case proven, encroach on the freedom of belief of more than a billion and a half billion Muslims in the world in general and Muslims in the Egyptian state in particular in their belief in Islam and the abuse of their religion represented by the Holy Prophet. Accordingly, under the international treaties referred to, there remains an obligation on the part of the NTRA to protect religious beliefs in general and to protect others from embracing what they chose without being coerced, insulted of subjected to any coercion, especially that coercion in the field of communication is considered a moral coercion, the effects of which surpass physical coercion with serious consequences that that affect national security of the Egyptian state; that encroaching on the belief system of Egyptians results in undermining the state and the collapse of its pillars, exposing Muslims and Christians to a sedition, the result of which is known only to God. Accordingly, the responsibility of NTRA to regulate communications is a national, religious and humanitarian duty that entails the necessity of intervening to perform its duties on the grounds that it is necessary it enforces its powers in the face of the aforementioned violation, even in the absence of a legal claim. However, the report of the state council commissioners noted that despite all the above, “the harm of total closure of YouTube will prejudice the freedom of thought and expression in addition to prejudice services provided by YouTube that serve other areas, including dissemination of the peaceful teachings of Islam; also that closure of You Tube will result in major damage that may amount to losses of hundreds of millions of pounds, according to the administrative body”. After the deliberation of the proceedings, the Supreme Administrative Court issued its ruling at the end of May 2018, which ended up accepting the two appeals in form and rejecting their subject , which means supporting the ruling of the Administrative Court. The Supreme Administrative Court neglected the second half of the report of the State Commissioners, which it set aside and adopted in its judgment the same grounds on which the Administrative Court’s decision was based. It found that both Article 67 of the Telecommunications Regulatory Act and Article 19 of the International Covenant constitute the legal basis, which obliges the administrative bodies of the State to take action to decide on the block. However, the supreme administrative ruling has carried signs and perhaps clear messages, since it explicitly states that there are no provisions in the Egyptian laws regulating the blocking of websites. However, this should not be an obstacle to the administration to impose its control and to confront situations that threaten national security. However, the court did not succeed in establishing a clear definition of the concept of “national security”. It went further and demanded the enactment of laws to criminalize any broadcast that would undermine beliefs and religious constants.